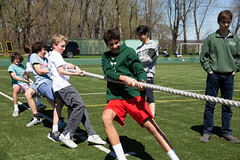 Many consider The Hotchkiss School to be the leader in environmental awareness among the top prep schools in the country. 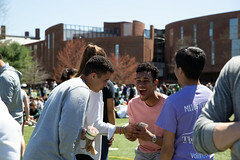 The U.S. Environmental Protection Agency recently rated the school as the eighth largest purchaser of green power among K-12 schools. When Malcolm McKenzie assumed his role as Head of School, he created two new positions that focused on environmental issues, then reduced the school’s energy consumption, increased its use of alternative energies, and purchased carbon offsets. “We have pledged to be carbon neutral or negative by the year 2020,” Mr. McKenzie said. 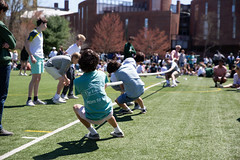 To reach this goal, Hotchkiss has made changes around campus. The campus herb garden produced enough this fall that the kitchen had no need to purchase herbs from outside sources. Many of the vegetables purchased are grown at local farms. Seven and a half percent of Hotchkiss’ energy comes from renewable sources, a third of this amount coming from a wind farm in upstate New York. Four buildings on campus, including two dorms and their music building, are LEED (Leadership in Energy Efficient Design) certified. Mr. McKenzie has found the faculty to be receptive to bringing environmental awareness to all aspects of school life. Because he believes that the environment will be the main problem in the current generation’s future, he feels that students must begin learning to appreciate the connections between these issues and all areas of their lives. He also believes that more hopeful stories and ideas should be offered to our age group. “Too often [students] hear of doom and gloom,” implying that it is easier for students to simply ignore the problem if the only news they hear about it is negative. 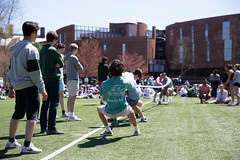 Every spring on “Eco Day,” all students and faculty take the day off from classes to spend time working at the school’s farm, gardening around campus, collecting trash from roadsides around the school, and many other activities. There are opportunities for those who do wish to regularly help out around the school. Abby Hoskins `11 plans to devote her spring term afternoons to working at the farm instead of playing a sport. Also, one of the most active groups on campus is Students for Environmental Action. As opposed to Deerfield’s system of separate proctors for environmentalism and residential life, each proctor at Hotchkiss is responsible for reminding their proctees to conserve energy. In Hoskins’ experience, the entire student body is at least aware of environmental issues if not fully supportive and participatory.